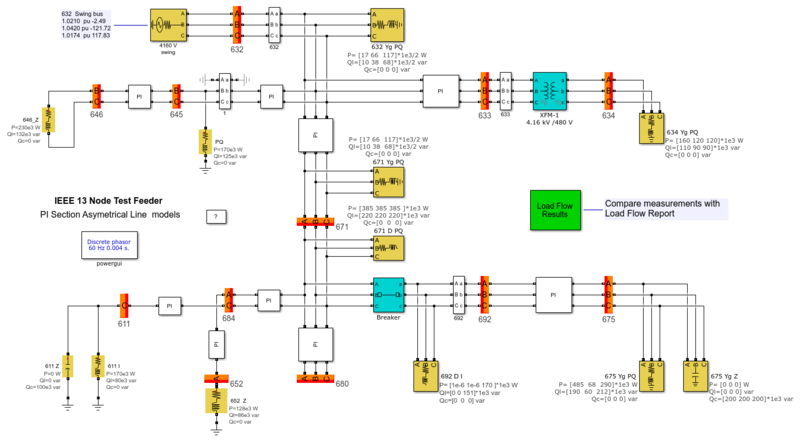 Create an electrical subsystem, simulate transients, and discretize simple circuits. Model and discretize simple motors with specialized blocks. Use the FFT Analysis tool of the Powergui block to perform harmonic analysis. Modify Simscape™ Electrical™ Specialized Power Systems block parameters and automate simulation using MATLAB® scripts. 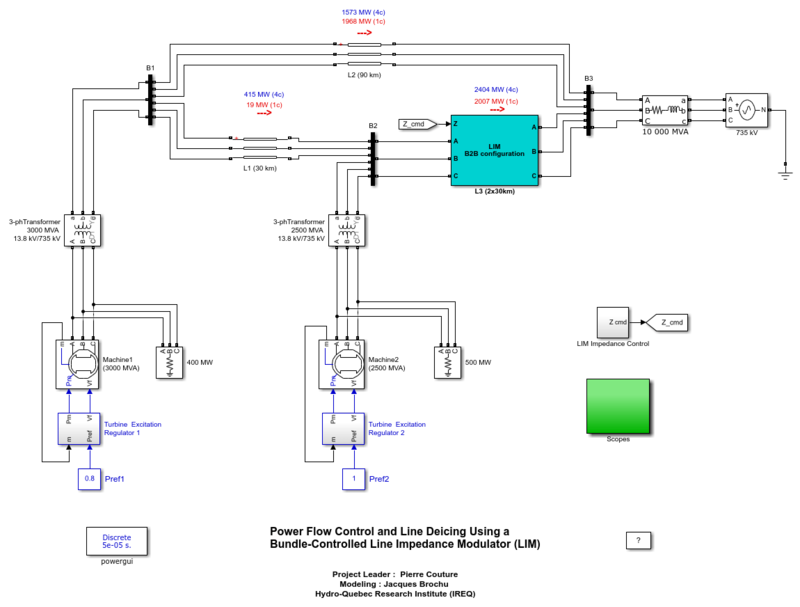 Learn how Simscape Electrical Specialized Power Systems initializes and runs your models. Explore the advantages and disadvantages for continuous, discrete, and phasor simulation of power system models. 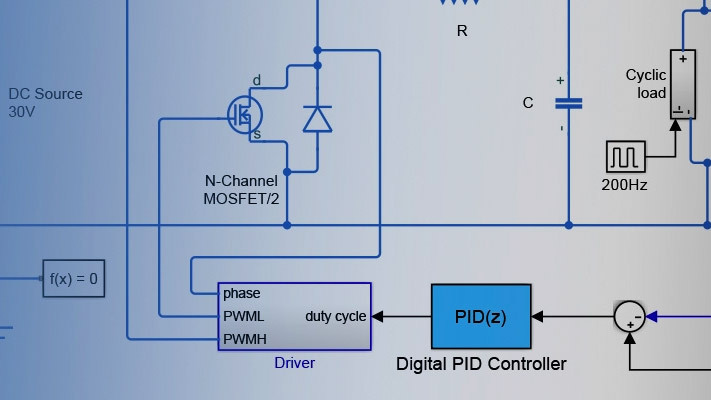 Learn about methods for continuous simulation of switches and power electronic devices. Learn about methods for discrete simulation of switches and power electronic devices. 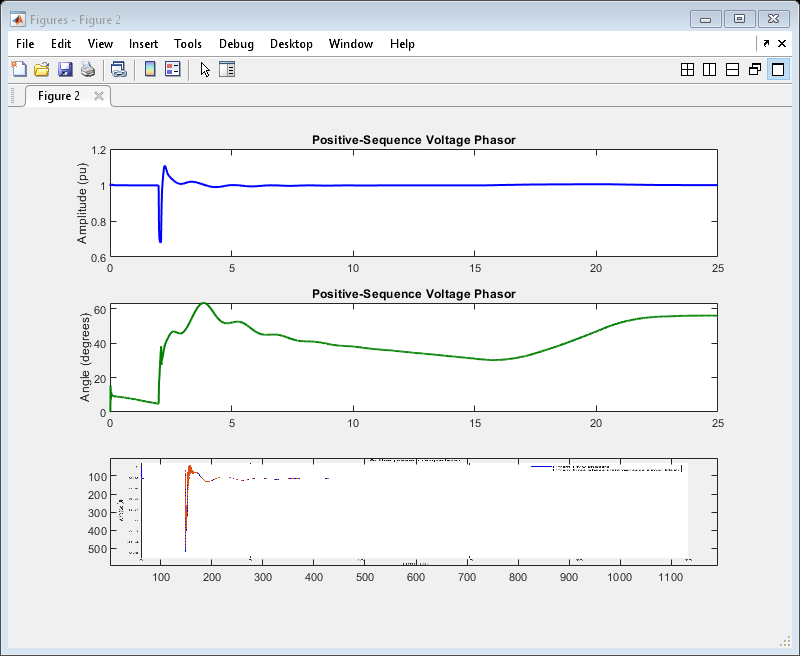 Use the phasor method to analyze magnitudes and phases in linear circuits. 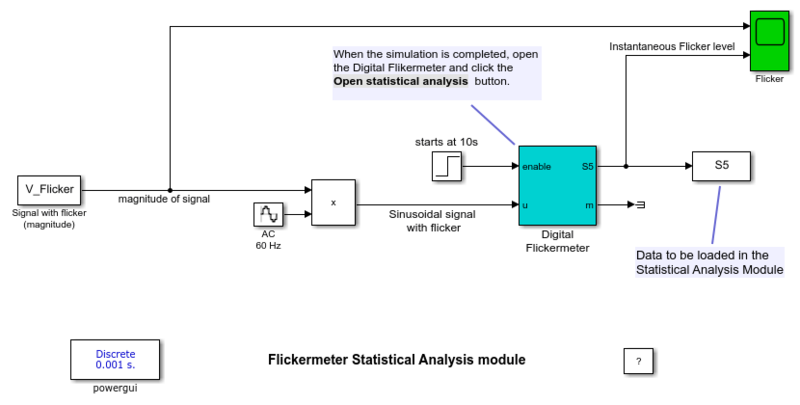 Optimize simulation speed by discretizing your model or by using Simulink® Accelerator mode. 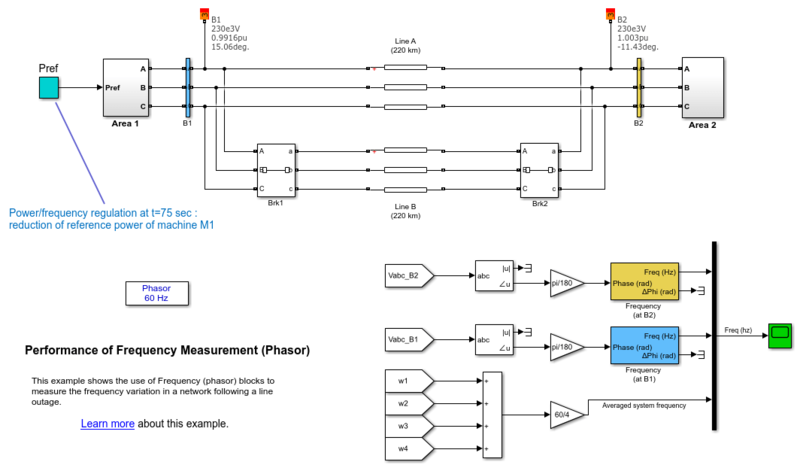 The use of two Frequency (Phasor) blocks to measure the frequency variation in a network following a line outage. The use of the PMU (PLL-Based, Positive-Sequence) block within the Kundur's Two-Area System. 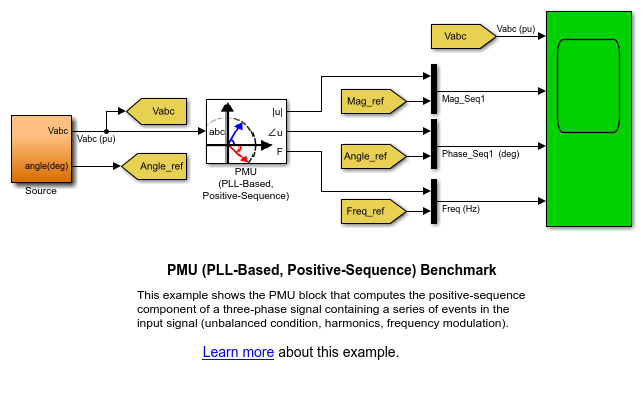 The use of a phasor measurement unit - PMU (PLL-based, Positive-Sequence) in a benchmark circuit. The use of the Load Flow tool of Powergui to initialize the IEEE 13 Node Test Feeder circuit. A method to compute short-term flicker severity of a phase-to-ground voltage taken from one feeder of a given remote community. 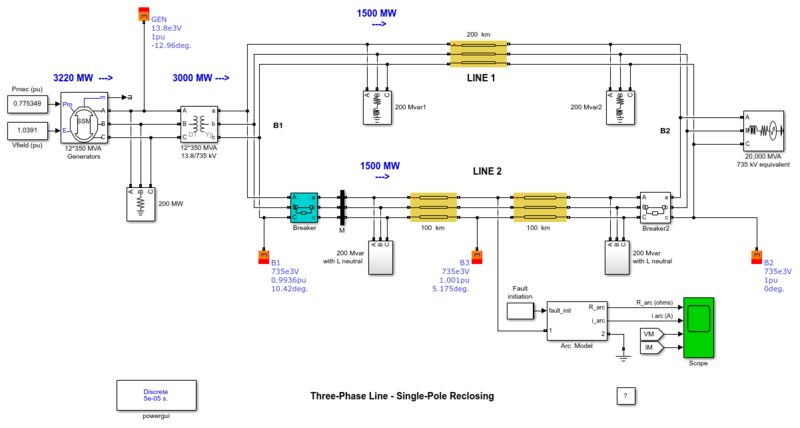 How power flow control and deicing of a transmission line could be implemented using the Line Impedance Modulator (LIM) technology. 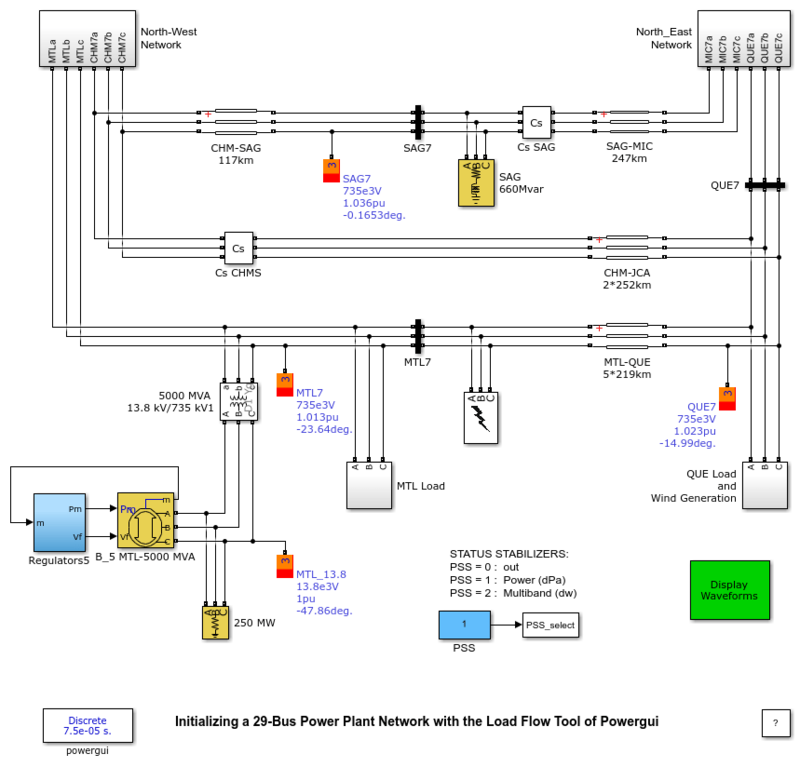 The use of the Load Flow tool of Powergui to initialize a 29-bus 735 kV network with detailed modeling of power plants using hydraulic turbines, speed regulation, excitation systems and power system stabilizers. 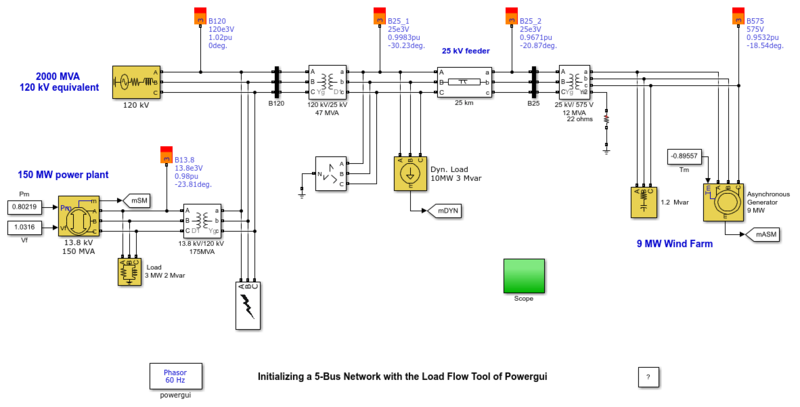 The use of the Load Flow tool of Powergui to initialize a simple 5-bus network consisting of a wind farm connected to a 25-kV distribution feeder and exporting power to a 120 kV network. 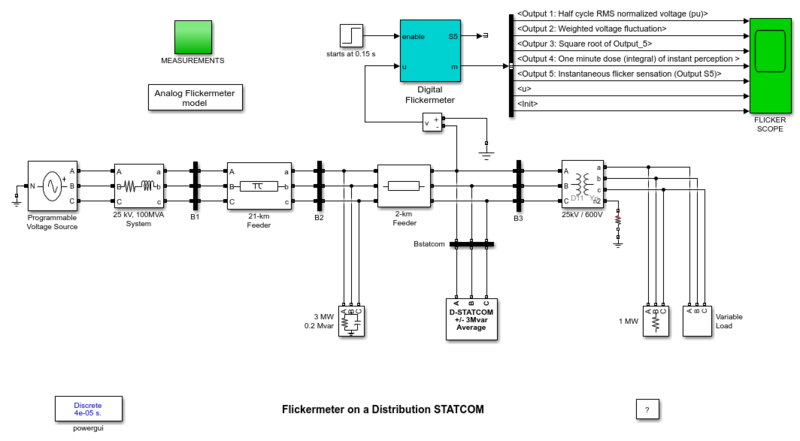 A flickermeter model designed according to functional specifications of the international standard IEC 6100-4-15 . Frequency-domain and time-domain analysis of a series-compensated transmission system. 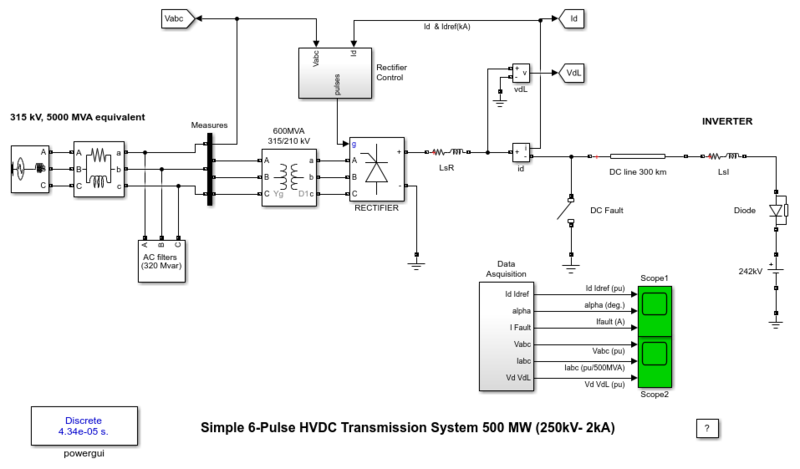 The steady-state and transient performance of a simple 500 MW (250 kV-2kA) HVDC transmission system. 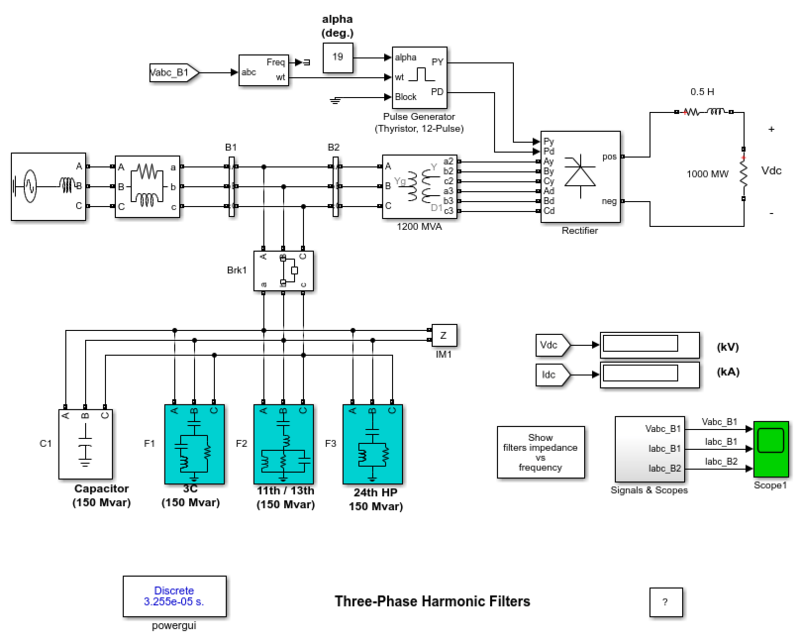 Three-phase harmonic filters in HVDC installations. The use of a shunt active harmonic filter (AHF) to minimize the harmonic content propagated to the source from a non-linear load.